I’ve long had an affinity for fine shotguns and double rifles, even if my wallet hasn’t, but I’ve been fortunate enough to have at least drooled over some very fine and outrageously expensive guns firsthand and even shoot a few now and again. I remember, in particular, one little gun shop in Easton, Maryland, that I used to stop by every couple months on my way home after shooting sporting clays elsewhere on the Delmarva and Eastern Shore. 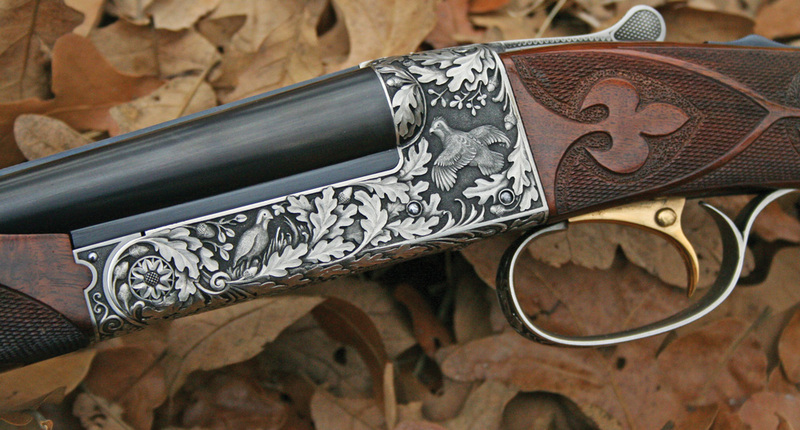 For the longest time, Albright’s Gun Shop (which today seems to be thriving, carrying a wide variety of top-end doubles and other shotguns from Beretta, Benelli, Caesar Guerini, and others, plus offering a full range of gunsmithing and firearms restoration services), had a LeFever double barrel perched on the rack among a bevy of other doubles new and antique. Truly a piece of Americana, and a good gun in its own right, though certainly not on a par with Purdey or other London Best, I craved that gun for the longest time. What stopped me from splurging on that handsome dark-wooded gun was the barrels of Damascus steel. I just didn’t know enough about shooting such a gun safely with blackpowder shells, nor even if the gun itself was in shootable condition. If I only knew then what I know now. Or at least had Diggory Hadoke’s Vintage Guns at my fingertips. This tome addresses all the worries I had then and would still have today, including safety, renovation, and maintenance, and the amply illustrated book covers boxlocks, sidelocks, and even the flintlock, plus ejectors, chokes, ribs, proofing, and more, everything the vintage shotgun owner would want to know about. Best of all, the book isn’t aimed at gunsmiths at all, but rather the actual shooter, the person who wants to take these guns out in the field and continue their legacy of productivity and beauty. In all, a incredibly useful book that should be right at hand next to the screwdriver set on the workbench of every vintage double-barrel shotgun owner. As you read this, our revamped, reorganized, and solidly updated Cartridges of the World, 13th Edition, is headed to the printers. During the last several months I’ve spent working on this volume, I’ve had the opportunity to read the 12th Edition more than once cover to cover, and while there’s much to this book to satisfy the curious, the parts that drew me in are the ones probably most overlooked, the chapter on shotgun shells and another smaller section on English gauge rifles. The information is now a combined single chapter on the subject, and the information there makes an excellent pairing to Vintage Guns. After all, if you’re going to take a piece of history into the field for hunting and sport, you better know what ammunition to put through it. Cartridges of the World, 13th Edition has had more than 50 new cartridges added since the last edition, and this volume includes a bonus CD of more than a 100 obsolete, weird, and you’ve-never-heard-of-’em cartridges. It’s available for pre-order now with special pricing at www.gundigeststore.com. ❰Why are Zombie Guns So Popular?